Karva Chauth is a one-day festival celebrated by Hindu women. 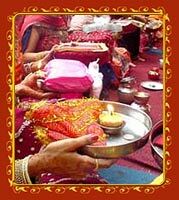 karva Chauth vrat is an ancient Indian tradition, which is still followed with full warmth and admiration by almost all married Indian women. Indeed, every women want to pray for the happiness and long life of her husband. Food items, beauty essential or makeup items, clothing items, and puja items constitute the significant items that are required for karva Chauth festival by the woman performing the karva Chauth Fast (vrat).